SpaceX successfully completed the maiden flight of its new rocket, the Falcon Heavy, earlier today. This new heavy lifter can launch 63.8 metric tons to low Earth orbit, compared with 22.8 metric tons for the Falcon 9, making it officially the most powerful rocket in the world today—twice as powerful as the runner-up, the Delta IV Heavy. In doing so, it puts itself in the same club as the Saturn V, the Space Shuttle, and the Soviet space shuttle knock-off, Buran, as the only larger rockets to successfully launch. And it launched a Tesla Roadster into space. And not just that. It’s going on an interplanetary orbit between Earth and Mars. The Falcon Heavy is basically three Falcon 9’s strapped together, which as any rocketeer knows, means more than three times as many things that can go wrong. As it happens, the launch wasn’t completely successful. The first stage center core failed to land on the drone ship in the Atlantic due to an engine failure in a rare miss for the usually successful SpaceX. Nonetheless, they did successfully land the two boosters on adjacent launch pads within seconds of each other, which is pretty cool by itself. What impressed me the most about this launch was how smooth it was. I remember seeing Space Shuttle launches back in the day, and they were an ordeal to sit through—stopping the countdown clock at 20 minutes and again at 9 minutes and ever more if anything went wrong. Maybe SpaceX will be slower when they actually start launching people (hopefully later this year), but at least they keep the clock running and let 20 minutes actually mean 20 minutes. But it really goes further than that. Think about it. Elon Musk just launched a car into space on the most powerful rocket in the world just because he could. 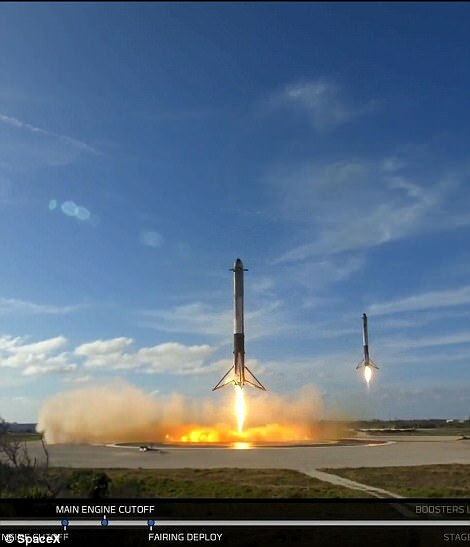 In doing so, SpaceX orchestrated its most complex launch yet including a twin booster landing where major governments use parachutes and fish them out of the ocean, and despite the failure of the third landing, they made it look easy. NASA wants a new heavy lifter that’s twice as powerful as the Falcon Heavy. But I’ve been thinking this to myself since about 2011, and I’m going on record: SLS is going to be cancelled, and SpaceX (or maybe a competitor) will take over for it before it ever gets a crewed flight. I’m far more optimistic about SpaceX than I am about NASA (at least on the human spaceflight side), and I hope to see more milestones from them very soon. This entry was posted in Current events, Space exploration and tagged Elon Musk, Falcon Heavy, SpaceX. Bookmark the permalink.